It's a common bond that 99% of males when looking at their wardrobe wish they had Batman's suit of armour hanging in there somewhere. While four out of five people know anyone can make up statistics, Samuel Lee aka DeviantARTist Azmal (the same dude who brought you this wicked get up) hasn't let the numbers stop him building his own Bat-suit - and it's not the usual pointy eared spandex variety. Going Medieval in all the best ways possible, Samuel has crafted a true Dark Knight for the ages. 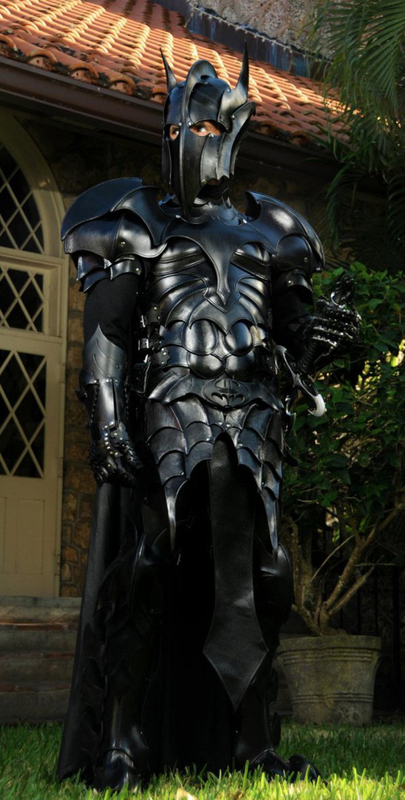 Now complete with Bat-sword, the only number I want to know is how much he'd charge for a turn in it! What Do You Think? Comment below and let me know! To view Lee's online gallery click here, to see it all on Facebook go here, or to place an order for a custom-made Medieval Bat-suit of your own, visit Samuel's Prince Armoury website right over here. oh my good god now that is pimp. I've just finished reading G.R.R. Martin's Song of Ice & Fire series and this would fit right on in. "Bruce of House Wayne." I like the sound of that. Hey Pensol! 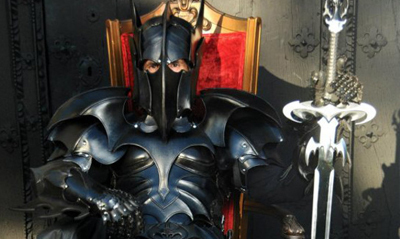 You are right, that does have a pretty sweet ring to it... my I think he looks like the Gotham equivalent of Sauron from Lord of The Rings - come to think of it, that's a pretty cool crossover too!